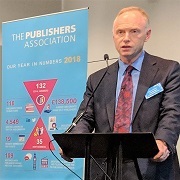 I'm really honoured to be here as the new president of the Publishers Association (PA). I've been lucky to have had two great predecessors in Charlie Redmayne from HarperCollins and Lis Tribe from Hodder Education. They're hard acts to follow. Both Charlie and Lis have - with Stephen - led the PA on issues ranging from diversity to intellectual property and all points in between. I'm hugely grateful to them both and look forward to working with Charlie as the PA's past-president and with Annie Callanan from Taylor & Francis as the PA's new Vice-President. This afternoon there are two things I'd like to do. One is to remind us all why publishing remains important in this changing world. The other is to set out our agenda for the next 12 months and how we can make progress on it together. "Publishing has succeeded in linking the strengths of the past with the imagination and ambition necessary to engage with the future"
Some of you may have heard a recent episode of the Today Programme in which a presenter said that the publishing industry could sometimes feel as if it were from a "different century". It's true that publishing's roots lie in a past century. But those roots have enabled it to grow into an industry that future generations will benefit from for a long time to come. Almost 500 years ago Henry VIII granted a licence to Cambridge, the world's oldest publisher, to print "all manner of books". With the increasing availability of printing presses came a torrent of books, newspapers, journals and pamphlets, as well as the challenge of how to balance the influx of published ideas, with responsibility of expression and freedom of speech. · And a great source of wellbeing in our society - with new research showing that reading reduces feelings of social isolation and provides an effective form of support for issues like depression and anxiety. As we engage with the opportunities and challenges in a world of big tech and changing patterns of trade, copyright is what underpins the continuing ability to create and reward content of imagination, truth, learning and innovation. Similarly, the level of disruptive innovation taking place in our modern society echoes the disruptive consequences of the printing press all those centuries ago. And today - as in that previous age, and alongside the enduring appeal of the physical book - we see publishers energetically pursuing innovation through new technologies. Digital income from academic journals has reached £1.3 billion as publishers use new technologies to help researchers and learners discover and use content more widely than ever before. Sales of digital audiobooks have doubled in the last five years, driven by the ubiquity of smartphones, and opening up books to new consumers, whether they are on the go or find reading difficult. And publishers are using machine learning to measure students' progress, and speech recognition tools to improve the discoverability and accessibility of our products. It's all too easy superficially to pit publishers and their history against the technologies of the future. But as an industry, we're showing we are champions of innovation and technology, while still providing the benefits of high-quality, curated content in a world which can often feel saturated by a desire for immediacy over depth. · The importance of the role of publishers in learning in its broadest sense. I'll talk about Brexit first. The process of Brexit has been uncertain and difficult for us all, irrespective of our individual political views. Whatever happens - whether the UK has its own independent trade policy for the first time in generations, or whether it stays closer to the EU as its largest trading partner- international trade will remain critically important to the UK. We're already the number one exporter of books in the world, making up 17% of the global marketplace. Export income from publishing has risen to £3.4 billion, accounting for 60% of UK publishing's revenues. Wherever this uncertain Brexit journey takes our country, we need to build upon this success story. Over the next year, I want to underline the export power of our industry, ensuring government understands better the benefits and trade policy needs of UK publishing, through continued engagement and robust, tangible evidence. Secondly, I want the Publishers Association to focus on the importance of investment in content. Publishers are guardians of truth and quality because of our rigorous approach to content selection, enhancement and production. The UK's academic journal publishing, for example, is a global export leader, supporting a £33bn research & development sector and a key input to scientific and academic conclusions. Without that investment, research communication would be much less effective. Finally, I'd like to talk about the importance of publishers in learning. All publishers are educational publishers in one way or another. From the children's book that fires a child's imagination, the textbook that helps a student understand a lesson, the novel that unlocks an understanding of human behaviour, to the journal that puts the latest medical research in the hands of our health service. Education, literacy and the advancement of knowledge are at the core of what we do; and they're fundamental to the success and richness of the society we live in. Research commissioned by the PA found that on average, a textbook has only to save a teacher four minutes a day to pay for itself. Over the next year, the PA will commission and share more research to show the contribution publishers make to an educated, informed and literate society. The three aims I've outlined are ambitious, and none of them will be achieved in a year. Nor can they be our exclusive focus. Unpredictable events may well mean our priorities need to evolve. But these aims can provide a sense of direction and purpose. I hope we can gather around them, working to achieve them together under the umbrella of the Publishers Association and with the other parts of the book industry represented here today - because the PA is as good as the organisations that make it up. It's up to us, its members, to give the organisation the support it needs to pursue change and to promote the benefits publishers bring. · benefits to society through education and learning in its broadest sense. Underpinning all that, it's vital that we argue passionately for a copyright system that continues to provide a judicious balance between freedom of expression, property, and the public's right to information. So, to come back to that quote I started with, publishing has come "from a different century"; but it has succeeded in linking the strengths of the past with the imagination and ambition necessary to engage with the future. Let's use the next 12 months to demonstrate that to the outside world. Peter Phillips is CEO of Cambridge University Press and president of the Publishers Association.